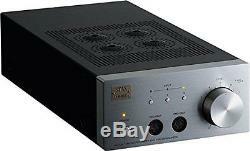 STAX SRM-007tA Driver Unit for Stax. My store sells only 100% authentic items. A vacuum tube is mounted on the final stage. This item is a high-grade driver dedicated to the stax headphone which adopted balanced method amplification. Dimensions: 195 x 103 x 420mm. Frequency: DC100kHz / +0, -3dB SR-007. Harmonic Distortion: <0.01% / 1kHz 100V r. When using SR-007A or SR-404. Input Impedance: 50K / Balance 50K×2. Standard Bias Voltage: PRO Bias DC 580V. Power: AC100V ± 5%, 50 60Hz (You may need appropriate voltage converter). XLR Polarity: 1: Shield, 2: HOT, 3: COLD (European method). EMS is about 5-10 days to USA. However, depending on the foreign transportation situation, the period during which the item arrives is uneven. We will pack the item with extreme care. You can confirm the situation on the homepage of the post office. If you have any question, please feel free to contact me. International Buyers - Please Note. The item "STAX SRM-007tA Driver Unit Stax F/S from Japan with Tracking EMS Shipping New" is in sale since Wednesday, December 21, 2016. 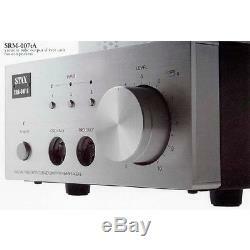 This item is in the category "Consumer Electronics\TV, Video & Home Audio\Other TV, Video & Home Audio". The seller is "happiness-japan*" and is located in Tokyo. This item can be shipped worldwide.